Not Your Mother's Book Club presents New York Times-bestselling author and Sundance Grand Jury Prize-winning screenwriter Jesse Andrews in celebration of his hilarious and riveting new book, Munmun. 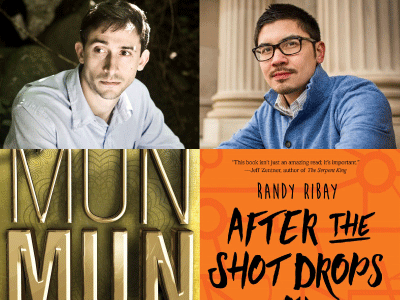 Jesse will be in conversation with Randy Ribay, author of the critically-acclaimed novel When the Shot Drops. In an alternate reality a lot like our world, every person's physical size is directly proportional to their wealth. The poorest of the poor are the size of rats, and billionaires are the size of skyscrapers. Warner and his sister Prayer are destitute--and tiny. Their size is not just demeaning, but dangerous: day and night they face mortal dangers that bigger richer people don't ever have to think about, from being mauled by cats to their house getting stepped on. There are no cars or phones built small enough for them, or schools or hospitals, for that matter--there's no point, when no one that little has any purchasing power, and when salaried doctors and teachers would never fit in buildings so small. Warner and Prayer know their only hope is to scale up, but how can two littlepoors survive in a world built against them?